Sign In, then Click on Register Myself, then in the below Program Options, click Add to include the mandatory Application Fee to your registration. Candidates may apply for any/all sub-specialties at the time of exam application for an additional charge of $100 each. Choose optional sub-specialties below to add to your registration. Non-Members: To apply for membership first to receive discounted member pricing: Click Create a new account (or Sign In to existing) and Join as a Professional Member. Then come back to register for the exam with updated pricing. If you have not done so already, download and complete the Exam Application after registering online. The application, all supporting documentation, CBK course (or education documentation) must be completed and returned with payment of all fees prior to the application deadline to determine eligibility. The application fee is non-refundable. 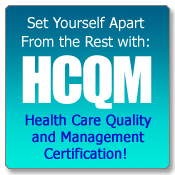 The HCQM Exam Fee is non-refundable, unless the candidate is ineligible to sit for the exam. If you have any questions, please contact Barbara Thomas at (800) 998-6030, extension 116. Exam application fee for candidates living in the U.S. and taking the HCQM Exam at a U.S. testing center. Exam application fee for candidates living outside the U.S. or taking the HCQM Exam at a non-U.S. testing center.